Notice: This page contains affiliate links and LAtourist will be compensated if you purchase attraction tickets after clicking on the following links. 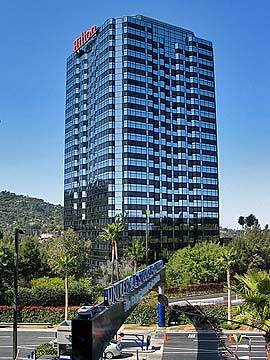 Hilton Universal City ($$$) 555 Universal Hollywood Drive. 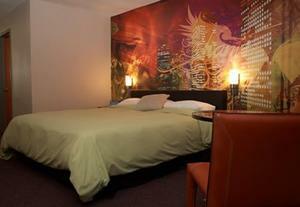 A 4-star deluxe hotel located on the hilltop near the entrance to Universal Studios Hollywood and CityWalk Hollywood. Attentive staff provides outstanding service, The 24-story hotel features large rooms that offer views of the Santa Monica Mountains, Universal Studios, Warner Brothers, The Walt Disney Company and NBC Studios. Includes free tram service to the park and CityWalk. Sheraton Universal ($$$) 333 Universal Hollywood Drive. Adjacent to Universal Studios. Includes free tram service to the park and City Walk. The hotel's concierges often direct guests to Burbank's "It's a Wrap," where they can buy clothes worn in movies and on TV shows. Rooms offer views of Universal Studios and the nearby Santa Monica Mountains. Tilt Hotel Universal/Hollywood ($$) 3241 Cahuenga Blvd. A 3-star hotel located very close to Universal Studios. The hotel has a 24-hour front desk and a laundromat. It's about a 5-minute walk to the Metro Red Line station (goes to Hollywood Blvd and downtown LA), or to the tram that takes you up the hill to Universal Studios and CityWalk. More restaurants and entertainment are nearby on Ventura Boulevard. [Walking Distance to Universal Tram; Free High-speed Internet Access; Free parking; Complimentary daily newspaper]. Tangerine Hotel ($$) 3901 Riverside Drive. A clean and comfortable motel with affordable rates plus easy access to Universal Studios and Burbank Airport. Tangerine Motel offers an eclectic and colorful backdrop to make your visit all the more memorable. The Tangerine's thoughtfully-appointed rooms are a reinterpretation of the classic motel room: simple, contemporary and minimalist in design, but each room is an individual canvas where bold strokes of color and imagery have been used to create whimsical and exciting spaces with distinct personalities. Although no two rooms are like, they're equally appointed with all modern amenities, including LCD TVs, iPod audio and video docking stations, free high-speed internet access, in-room coffee and more. Tangerine is within walking distance of Warner Brothers Studios and about a 5-minute drive from Universal Studios. Nearby there are two Metro buses (at Riverside Drive and Pass Ave) that take you directly to Universal City. [Free high-speed internet (WiFi and wired); Free parking; Free newspaper]. Best Western Media Center Inn and Suites ($$) 3910 Riverside Drive. A 3-star hotel that offers nice rooms and spacious suites with a modern look that is less "eclectic and colorful" than the Tangerine Hotel (across the street). It's easy to get to Universal Studios or the Red Line train station. [Free high-speed internet; Free parking; Free continental breakfast; Free local calls]. Hotels near Hollywood Blvd: The iconic tourist district of Hollywood. Here you will find the Walk of Fame (stars on the sidewalk), the Chinese Theatre (handprints in the cement), Hollywood & Highland, Madame Tussaud's and other popular attractions. You can take the Metro Red Line train from the Hollywood and Highland station to the Universal City station, then cross the street so you can take a free tram up to the theme park. 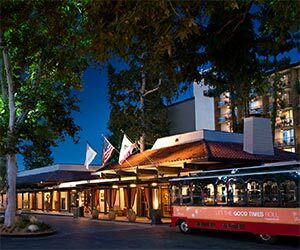 Hotels near Metro Red Line Train Stations: A list of hotels and motels between Hollywood and downtown LA, within walking distance of a Metro Red Line train station. The rates are lower outside of the main tourist areas and many of these hotels include free parking and other benefits. You can easily take the Red Line train to Hollywood and Highland, Universal Studios, and downtown LA.